Funding for a pilot study on the pharmacokinetics of levetiracetam in clinical patients. The subsequent study based on this pilot data has been funded by Toby’s Foundation. This study is still in progress and active recruitment is ongoing that will evaluate if levetiracetam metabolism is altered in epileptic dogs that are also receiving other anticonvulsants (Group 1=levetiracetam and phenobarbital, Group II=levetiracetam, phenobarbital and potassium bromide and Group III=levetiracetam and potassium bromide). Epil K-9 has also been crucial in helping us recruit cases. Continued Assistance with the advancement of the Nationwide Database of Pets with Epilepsy, with 298 entries at the time of this update. Although there is not a specific financial cost with this, Epil-K9 has played a significant role in publicity for this project. Support for patient evaluation and publication cost involved in a case report describing potential hepatotoxicity associated with zonisamide administration in an epileptic dog. The case report is currently under review by the Journal of Veterinary Medical Science. Purchase of a portable display unit designed for Epilepsy Outreach and Education, as well as for recruiting clinical study cases. This outreach display is used at a variety of local events such as the Tar-Heel Cluster, Mid-Atlantic Hound Association show, local dog events and more. Our Seizure Studies volunteer, Willard Moore, primarily mans the unit. 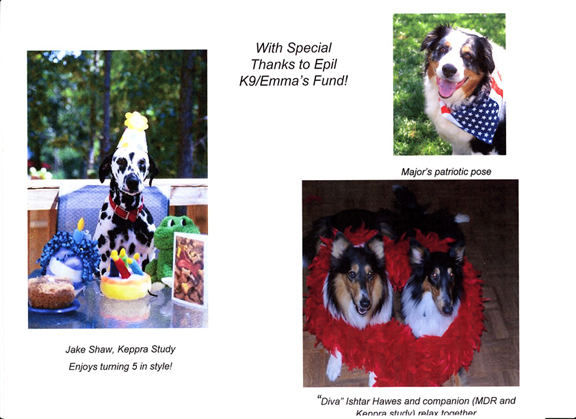 Willard is also an Epil-k9 member and two of his dogs were featured in the 2011 Epil-k9 calendar. Currently, we have a summer pre-veterinary student who is working with us to explore possible ways to monitor dogs for seizures while owners are away. Abby McElroy, a student from Smith College, is visiting NCSU-CVM this summer under the Abaxis Research Program. She is assisting with project research with the goal of identifying and testing units for this type of monitoring. Monitoring dogs with seizures while owners are away will not only help the owner, but also help clinical research by obtaining more valid seizure data. Plans for performing a midazolam pharmacokinetic study are also underway, with completion ideally to take place between July and December 2011. This study will explore routes of administration of midazolam, in hopes of determining the most efficacious route when used to control seizures at home. The pharmacokinetics of Diazepam (valium) are well understood in this regard. Midazolam is becoming more frequently used for emergency seizure management, but the pharmacokinetics of this drug have not been well-documented in dogs. There is controversy as to whether the drug is effective when given rectally. The proposed study aims to explore this and determine whether intramuscular administration is a feasible treatment option. Evaluating the impacts of dietary supplements in patients with epilepsy that are being treated with anticonvulsants such as phenobarbital. 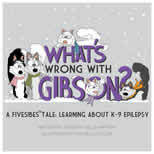 Expanded outreach efforts such as publication, video or more to help support canine epilepsy education, research and teaching. This also includes planned presentations by both Dr. Karen Munana and Julie Nettifee Osborne, RVT, BS at the 2011 ACVIM conference to specialty clinicians and technicians on epilepsy and client/patient support. Exploring the link between nutrition and epilepsy in possible collaboration with the NCSU-CVM Nutrition service. Please let us know if you have any ideas your group is interested in exploring as well! Hopefully we can continue to make strides together towards changing outcomes for pets facing epilepsy, as well as for their owners. We sincerely thank you all for your continued support and dedication!